Nourishing Body and Soul of Local Youth, Sunday, December 9, 2018. 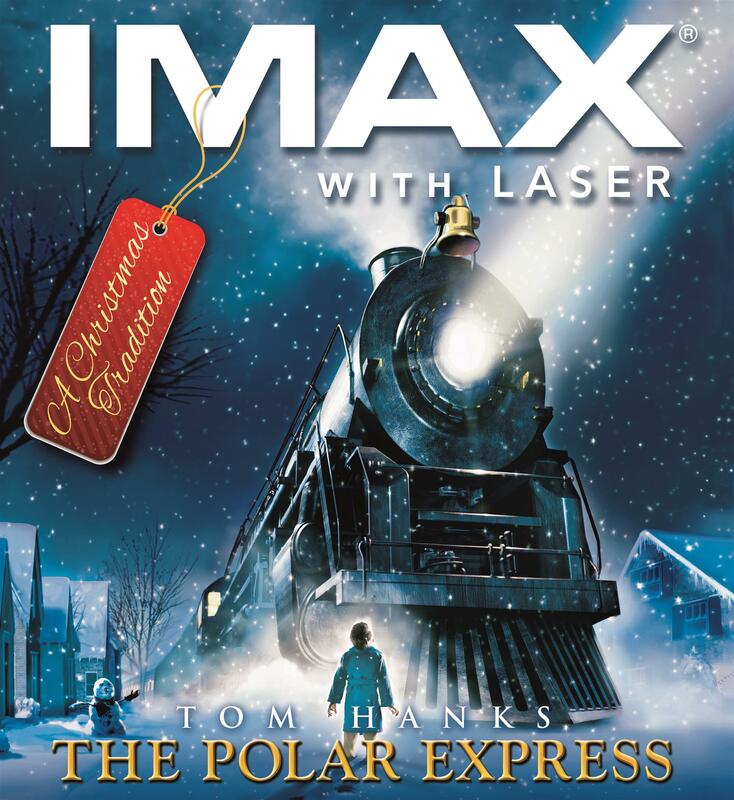 Sponsors have enabled us to invite 350 kids to a private showing of the holiday film Polar Express, with pancake breakfast. Proceeds to breakfast and music programs in Victoria schools. Heat Savers Fireplace & Patio Co. Sponsorship starts at $300 and benefits our youth. Want to join the above community leaders and get on-board? Contact Brian Shaughnessy by email . VICTORIA, BC, Monday, NOVEMBER 19, 2018 — According to the 2015 Canadian Census, 15% of children in Greater Victoria were living in poverty. That’s 3,000 kids. This is a 5% increase over 2010 and schools report that kids start the day hungry in almost every Victoria school. Several organizations, businesses and individuals have been stepping up to address these troubling statistics. One of these organizations is Breakfast2Music, a volunteer-led not for profit that is partnering with the Rotary Club of Victoria Harbourside. 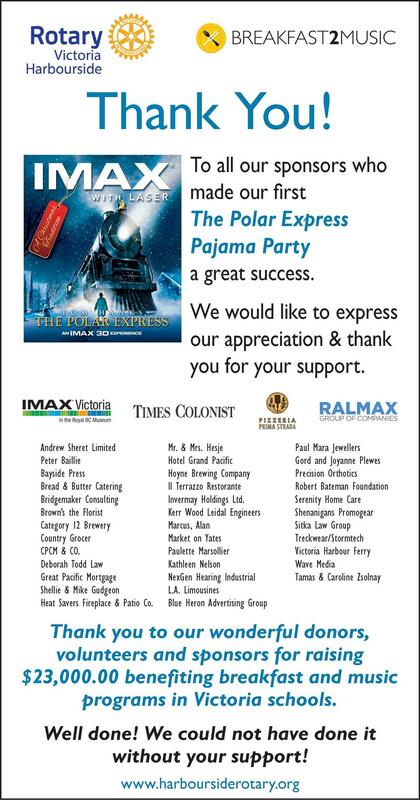 They are calling on other businesses to join them in supporting the Polar Express Pancake Pajama Party at IMAX Victoria on Sunday, December 9. This private party is sponsored by the local business community. Guests will include Grade 4 and 5 kids in urban Victoria school breakfast programs. Additional funds raised from the Polar Express Pancake Pajama Party will go towards breakfast and music programs for kids in Greater Victoria. It is unacceptable that so many children are going to school hungry. Insufficient nourishment impacts a child’s ability to focus, grow and thrive. Together, we can bring about change. “We have been supporting the meal programs at four local elementary schools for the past several years. We are proud to challenge other local businesses and organizations to step forward and support the leadership that Harbourside Rotary has taken with Breakfast2Music on this initiative. This year, we have dedicated $16,000 to our schools. We are also providing up to $4000 in matching dollars for the Polar Express Pancake Pajama Party” -Gary Liebel, Chief Financial Officer at Ralmax. Call To Action: The Rotary Club of Victoria Harbourside and Breakfast2Music challenge local businesses to participate in the Polar Express Pancake Pajama Party as sponsors, covering the cost of admission for children and also raising vital dollars to feed hungry kids. For more information on sponsorships, please contact Brian Shaughnessy at 250-580-5553 or bwshaughnessy@gmail.com or visit www.harboursiderotary.org. For more information on breakfast/music programs, please email info@breakfast2music.com or www.breakfast2music.com . Our "Thank You" advertisement in the Times Colonist.